With the harsh winter season looming and an ever-growing need for supplies to serve Buffalo’s most vulnerable residents, the Matt Urban Center is participating in #GivingTuesday – a global day of giving coming on the heels of Black Friday and Cyber Monday. The Matt Urban Center is a community based organization that has anchored the Broadway Fillmore neighborhood for over 40 years with the mission of providing programs that revitalize neighborhoods, serve families and change lives. The agency serves over 20,000 clients annually, from youth to seniors and homeless individuals to homeowners. For the past 10 years, the agency’s Hope Center has been a one-stop resource center for low-income residents to receive assistance with everything from housing assistance to benefits screening, financial wellness education, computer classes, job training, clothing donations, and personal essentials and food pantries. 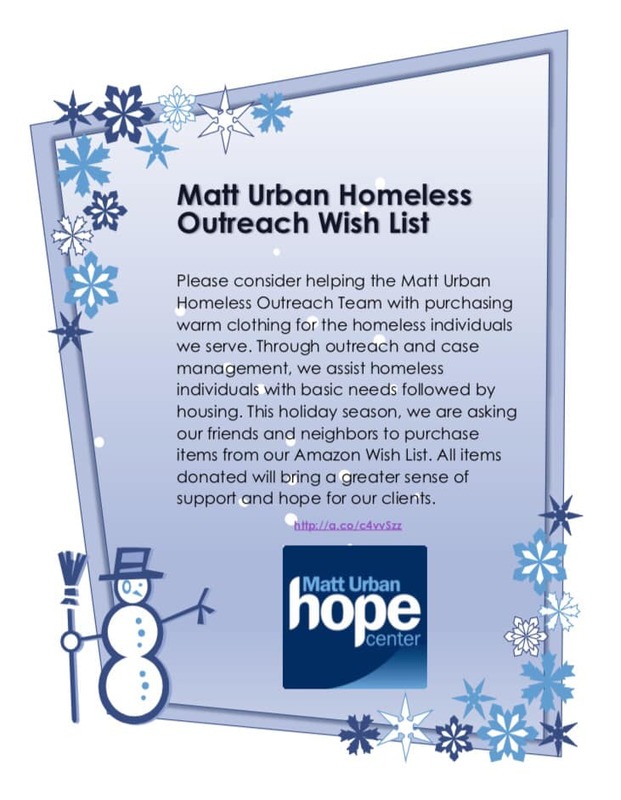 The Matt Urban Hope Center is also home to the Homeless Outreach team, which works tirelessly to connect homeless individuals living on the street with housing, food, clothing and healthcare. This team works in tandem with the agency’s permanent supportive housing team, which partners with local landlords to secure a safe home for our clients, and our Hope House shelter, which provides temporary haven for women and children experiencing homelessness. The Matt Urban Center’s staff has helped countless individuals to find stable, secure housing and provide them the additional supports to get back on their feet. One client was a homeless veteran suffering from mental illness and addiction issues, who had been in and out of incarceration. Our team helped him to find a safe place to stay and wraparound case management to help him tackle his health hurdles and maintain his housing. Another client was a mother of two who was struggling with an autoimmune disease, an abusive relationship, and loss of employment. She arrived at our Hope House shelter feeling completely defeated, but our staff quickly got her on the path to searching for housing and a primary care physician, as well as securing clothing and school materials for her daughter. The team helped her find an apartment and the client was able to enroll in a Medical Coding Program to eventually find a job and get back on her feet. In order to continue fighting for Buffalo’s most underserved, our agency relies on the generosity of local donors to continue our programs. This #GivingTuesday, we’re calling on our City of Good Neighbors to help us care for those most in need by making a donation to the Matt Urban Center. Monetary donations can be made online or via mail to Matt Urban Center, 1081 Broadway, Buffalo, NY 14212. A link to our donation page can be found at http://urbanctr.org/contact-us/donate-to-muc/. Our Hope Services team also welcomes donations of clothing and personal essentials for their homeless clients. A donation wish list can be found at http://urbanctr.org/hope-services/donation-requests/. For more information on giving to the Matt Urban Center on #GivingTuesday, contact Sarah Maurer, Development Coordinator, at (716) 893-7222 x232 or smaurer@urbanctr.org. 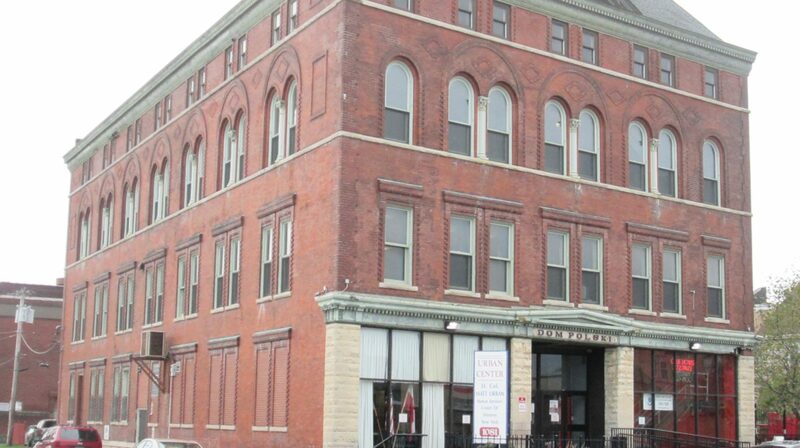 The Lt. Col. Matt Urban Human Services Center of WNY is a multi-purpose community center located on the East Side of Buffalo. It is our mission to provide programs that revitalize neighborhoods, serve families, and change lives. Starting your holiday shopping early? 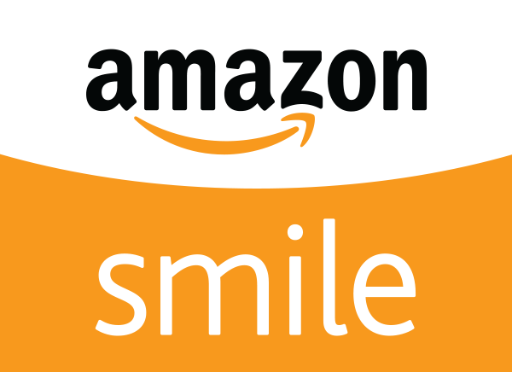 Did you know that when you purchase items through AmazonSmile they will donate a portion of the purchase price to an organization of your choosing? We hope you’ll consider selecting the Polish Community Center of Buffalo, Inc. (aka the Matt Urban Center) as you shop this year. It’s a practically effortless way to support us and all proceeds go toward the crucial programming we provide to the community! p.s. AmazonSmile isn’t just for holidays – you can use it year round! Toys for Tots is Underway! The Matt Urban Center is one of the 25 agencies participating in the annual Western New York Holiday Partnership, where we help distribute toys to low-income families to give their children. Families must be food stamp eligible and have children age 12 and younger. 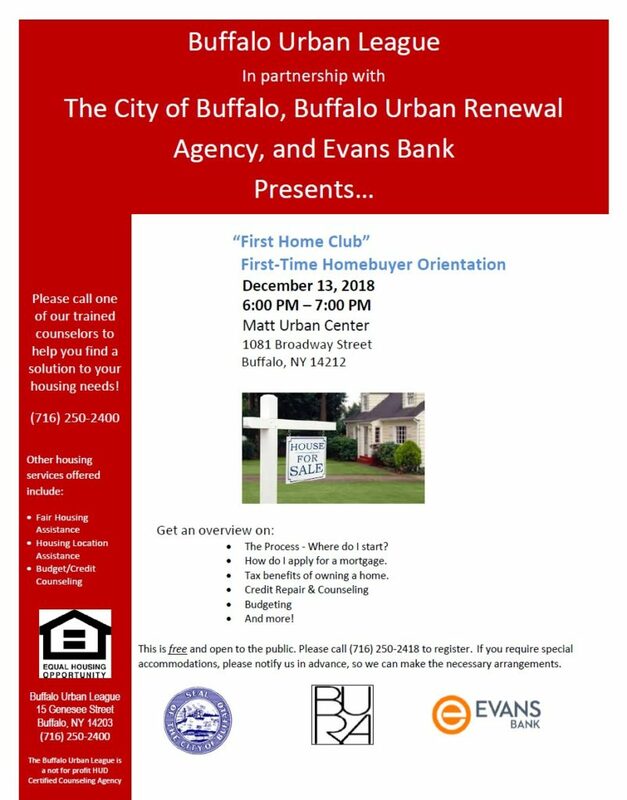 Families can apply for the program at the Matt Urban Hope Center (385 Paderewski Drive) or the T.J. Dulski Center (129 Lewis Street) between now and December 7. For more information, please contact Latasha Colbert (Hope Center) at ext. 313 or lcolbert@urbanctr.org or Danyel Sease (T.J. Dulski Center) at ext. 403 or dsease@urbanctr.org. We want to give a shoutout to our friends at the Buffalo Bills for their generosity! Last month, children in our afterschool program got a surprise visit from several Bills players at the Hope Center. 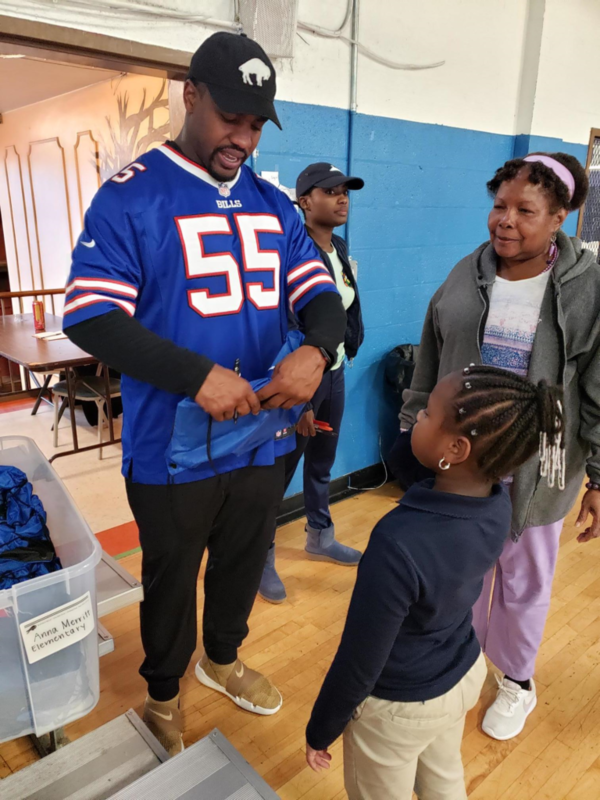 Patrick Demarco, Keith Towbridge, Eddie Yarbrough and Jerry Hughes came by to hang out with the youth, participating in different stations including slime making, face painting, Bills canvas painting, 3-point shooting and board games. The players also took photos with the youth and signed backpacks for them. We were honored to be recognized by the Buffalo Bills as the One Buffalo Organization of the Game at their October matchup against the New England Patriots! 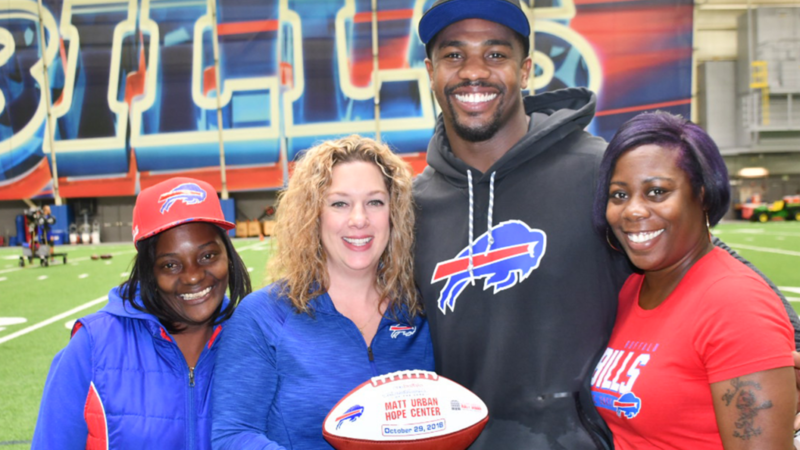 Bills veteran defensive end Jerry Hughes presented members from our Youth Department with a game ball. Thank you to our friends at the Buffalo Bills for going above and beyond for our organization and our community!